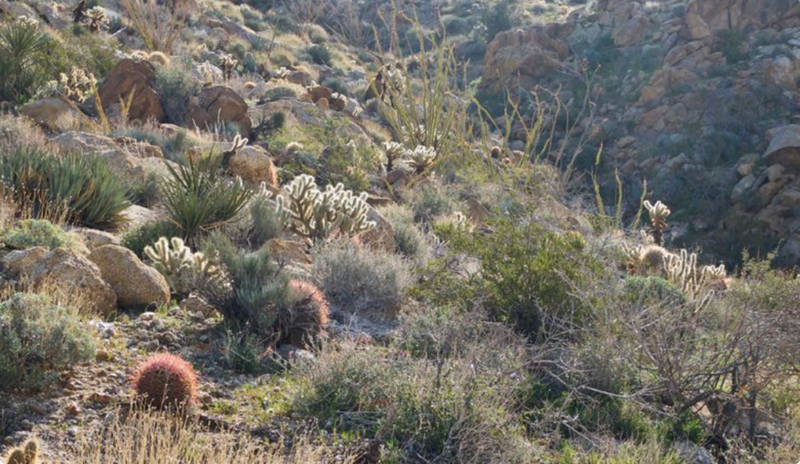 We finally have confirmation and a location for great winter hike into Anza Borrego State Park, this one at Plum Canyon lead by Larry Hendrickson, Colorado Desert District Botanist for the State Park. Larry has been an extraordinary influence for the preservation of the natural beauty and diversity of the many parks and reserves in the area, including Anza Borrego SP, Rancho Cuyamaca SP, and Palomar Mtn SP and the recreation areas of the Colorado River (Picacho area in particular) and the Salton Sea. He is part of the Botany Society and heads many volunteer excursions to remove invasive species from our fragile desert ecosystems. Plum Canyon is the old trail used by Native Americans, pioneers and travelers before the 78 was created. Named after the Desert apricot (Prunus fremontii) this hike boasts a wide variety of desert and transitional species. Keeping in mind that January is quite early for annual species, the recent rain (~1.2"!) will help along the early flowering perennials and shrubs. This trail is famous for its coverage of red and also orange Chuparosa (Justicia californica) and barrel cactus (Ferocactus cylindraceus) among many other beautiful cacti. A full checklist of Plum Canyon is available HERE: http://tchester.org/bd/flora/plum_canyon.html.Anza Borrego trips are always interesting at different times of year and in different areas because something is always unique and surprising, from flora flowering out of season, to superblooms, to the iconic wildlife that survives here. At the very least, this trip promises to provide a great day in bearable temperatures in the desert.